Shamanic Awakening. My Journey from Darkness to Daylight. A delightful account of one woman’s journey from the pain of losing a young child to a place of acceptance and in doing so discovering her true calling as a healer trained in various paths from north, central and south American traditions. I was fortunate enough to meet Sandy in person at Gateways Of The Mind – in Dublin last year, where after getting to know her over the 2 days of the event she gifted me a copy of her book. Sometimes you start reading books that just instantly resonate with you and you want to keep reading more. From beginning to end I continually found myself agreeing with the insights and wisdom imparted through the pages of this book, and wanting to know more about Sandy’s journey. Her story begins on a heartrendingly sad note as she struggles to overcome the pain and anguish of losing a small child, and dealing with the overwhelming grief that accompanied that. As with many voyages of self discovery it is at these darkest moments that the light shines forth and we are shown the path to a guide or teacher and so it is in Sandy’s case. Clearly a woman blessed with the subtle touch of intuition, her story is an excellent account of how it is to live with your heart open to the possibilities the universe has to offer and to continually remain in the flow allowing synchronicity to work. And so she is guided to the first of her teachers ‘Oh Shinnah’ whose teachings in her own words were a ‘confrontation to fixed realities’. From this point we are led through beautifully descriptive accounts along a path of learning that takes in many different traditions ranging from Baba Muktananda to the wisdom of the Toltecs, then on to the major teachers of her life such as Grandmother Twylah Nitsch – a Seneca Elder under whom she is initiated into the Wolf Clan Teaching Lodge. Along the way Sandy’s ideas of life and her perceptions of reality and what’s important are continually challenged and redefined, and we are taken by the hand and led down that path with her. As her story continues Sandy is led to new teachers from Central and South America. Training under Juan Nunez Al Prado in the Andean mystical tradition she becomes a 4th level priest and ‘chunpi paqo’ and later goes deeper into the Amazon to work with plant medicine and the Mother Vine of Ayahuasca. As the journey unfolds we are continually grounded back into reality as the wonderful shamanic wisdom is woven into the hardships of Sandy’s everyday life. Never far from personal heartache, Sandy does not shy away from the more difficult parts of her story; which in turn makes it all the more engaging and real. As a gifted dreamer she offers us valuable insights into how connecting more fully with our dreaming self can present us with important information from beyond the physical realms, which if understood and integrated correctly can have hugely important and far reaching benefits in our waking state. Always brutally honest, this book is an inspiring read that takes in a range of spiritual and shamanic paths and weaves them together into one person’s narrative of how pain and suffering can be transcended and processed into meaningful sense that can allow anyone to live a spiritually rich and rewarding life. In the process of doing so Sandy demonstrates not only how a woman can step into her own power and embrace the aspects of the Goddess, but also how everyone has the capacity, if they so choose,to embark on their own voyage and begin their journey back to a place of balance and self healing. 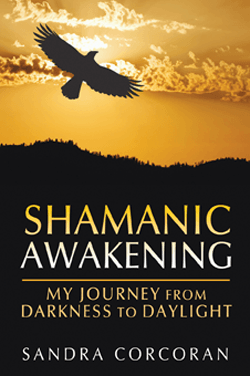 Shamanic Awakening was reviewed by Davyd Farrell, Conference Director, Archetype Events.